This year could be a blockbuster for redistricting reform. So far in 2016, serious reform efforts are underway in at least nine states, making the current wave of support for redistricting reform greater than at any other time in recent memory. Redistricting reform also garnered a prominent mention by President Obama in his State of the Union Address. Here’s a rundown of what to expect in the months ahead. A ballot initiative is primed for the general election in South Dakota, and a petition drive is well underway in Illinois. The amendments in both states, if approved this November, would create independent redistricting commissions and implement new rules designed to reduce partisanship in the redistricting process. In Illinois, the non-profit group Independent Maps has already collected more than 483,000 signatures. That’s nearly double the amount required to place an initiative on the ballot. Advocates are optimistic the president’s State of the Union remarks, as well as public support from elected officials like U.S. Reps. Cheri Bustos (D) and Darin LaHood (R), will help drum up support. The South Dakota proposal is backed by the South Dakota Farmers Union. The secretary of state certified the petition’s signatures late last year, paving the way for the amendment to appear on the November ballot. Advocates in Maryland, Colorado, and Ohio look to build on momentum carried over from the end of 2015. A special commission created by Maryland Gov. Larry Hogan (R) to review the state’s redistricting process released its report last November. The panel proposed creating an independent redistricting commission composed of equal numbers of Democrats, Republicans, and independents. Colorado lawmakers are also considering an independent commission, although minority groups hope to be able to revise some of the proposal’s language that they feel would harm minority communities. And in Ohio, advocates turn their attention to congressional redistricting as they hope to build on the 2015 ballot measure victory that created a commission for legislative redistricting. Prominent Ohio elected officials, including Gov. John Kasich (R), are in public support of congressional redistricting reform. Lawmakers in several other states have begun laying the groundwork for reform attempts of their own. Democrats in Florida and Georgia are pushing independent redistricting commissions and new rules to restrain the worst instances of gerrymandering. A bipartisan group in Virginia would leave redistricting authority in the hands of the legislature but impose some restrictions on how districts are drawn. 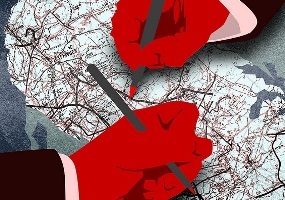 Lawmakers in New Hampshire have proposed yet another approach — they would have a redistricting commission create and submit district maps for final approval by the state legislature. There are many reasons for this groundswell of redistricting reform, but one of them seems to be a growing recognition and acceptance among elected officials and the American people that improving the redistricting process is a critical part of fixing our democracy. For a more detailed look at these reform efforts, read the Brennan Center’s analysis here. As the year progresses, we will continue to monitor these proposals, and others that are introduced. The Florida Supreme Court approved new congressional and state senate district maps at the end of 2015, bringing an end to the litigation saga that began prior to the 2014 election. Observers anticipate that the revised districts will provide a slight benefit to Democrats, but not everyone in the party is pleased. While the state legislature chose not to appeal the new senate map, U.S. Rep. Corrine Brown (D) filed another lawsuit claiming that her redrawn district violates the Voting Rights Act. Oral argument in the case is scheduled for March 25. A federal three-judge panel ordered Virginia to use a new congressional map for the 2016 election. The ruling comes as a result of the Virginia legislature’s failure to redraw the state’s 3rd Congressional District after it was struck down as an unconstitutional racial gerrymander. Shortly after the federal panel released the new map, a group of 10 current and former Republican members of Congress filed an appeal with the U.S. Supreme Court to stop it from being enacted. OneVirginia2021, a non-profit group pushing for redistricting reform, created a campaign video for Jerry Mandering, a satirical candidate for the state legislature, to emphasize the need for a better mapdrawing process in Virginia. The federal district court in the Wisconsin partisan gerrymandering case rejected the state’s motion to dismiss. Plaintiffs’ lawyers are optimistic that the case could rise to the U.S. Supreme Court and eventually result in the creation of a new legal standard for judging partisan gerrymandering claims. Julian Notaro of The American Prospect writes about the return of racial gerrymandering to the U.S. Supreme Court and its potential effect on minority representation in Congress. A new poll from Public Policy Polling shows that 60 percent of Ohio Democratic primary voters support redistricting reform to make congressional districts more competitive, whereas only 16 percent oppose such measures. The winners of Common Cause’s “Gerrymandering Standard” competition appeared in the December 2015 issue of Election Law Journal.